Live video is a great way to grow your community and show up on a more human level. Unlike regular video, the live format feels less rehearsed and edited, plus it shows up in your followers’ streams in a different way than regular video. Livestreaming is a great option for delivering breaking news, sharing the excitement and energy of a live event, and doing big reveals after a period of suspense. While livestreaming may feel unrehearsed, you need a plan. Define your audience. Figure out who you are trying to connect with and ask yourself whether you have the expertise or credibility to satisfy that audience. If not, can you invite someone to join you who does? Invest modestly. Don’t be overly ambitious out of the gate. I like to say, “Start where you are.” Don’t feel you have to make large investments in technology before you test whether livestreaming works for you. Do invest in decent lighting and sound as a baseline. With experience, you can grow your equipment list. Embrace consistency. As with any content marketing initiative, avoid the one-and-done approach. If you’re considering livestreaming, make a commitment to publish on a regular schedule. Be human. Livestreaming isn’t intended to be pristine and perfect. Be yourself; embrace your quirks and sense of humor. If you do, chances are good you’ll connect with like-minded people. Don’t overproduce it. People want to connect with a person, not a company. Be yourself – be it weird, funny, or quirky. The more of yourself you show, the better. People can spot a phony from a mile away. Sound and lighting matter. Even with great ideas and an excellent on-air personality, poor sound and lighting will kill your livestream. You need a hands-free microphone, portable lighting, a tripod and/or stabilizer, and a reliable connection to WiFi. I also recommend an additional battery and a Bluetooth-enabled remote for your camera/smartphone. Promote it. Don’t forget to promote your livestream. Tell others about it before you go live and personally invite like-minded people in your industry. Deciding to stream is the easy part. Now consider which platform(s) make the most sense for your audience and business needs. Pro: Facebook Live offers a huge, built-in audience and rich metrics. Plus, you can leverage retargeting opportunities. Facebook Live lets you co-broadcast with others, much like recording a Google Hangout. And when you go live, your friends and followers receive a notification. Con: While you benefit from Facebook’s massive audience, you lose on SEO. Chances are viewers won’t easily find your video again unless they know your channel or find it on YouTube. And, on Facebook, you have no control over advertising running next to your content. Pro: When you go live on Instagram, your followers get a notification – a big boost compared to some of the other live channels. Like Facebook, you can co-broadcast your Instagram livestream – which means a bigger audience for both parties. Con: Instagram doesn’t allow your followers to watch your video in your stream after 24 hours and your stream isn’t searchable. Pro: While many platforms fall short on SEO points for users, YouTube Live delivers. The site is the second-largest search engine in the world, and it integrates with Facebook and Twitch. The site also offers more tools for creating such things as events, pre-roll, and thumbnails. And, for those who want it, YouTube Live supports 360 video. Con: YouTube Live is one of the most-blocked sites among employers and universities. Unlike other channels that send notifications of livestreams, you have no control over whether your YouTube followers see your livestream. Pro: Periscope (owned by Twitter) has a loyal following among livestreaming devotees. It’s easy to use and has a bent toward breaking news-type stories in part due to its connection to Twitter. Periscope supports 360-degree video. Con: It is not searchable. It also has limited controls for creators; for example, you can’t add pre-roll or thumbnails to your stream. Pro: This niche channel is dedicated to sports and gaming – making it a perfect match for B2C brands with a younger audience. Old Spice partnered with Twitch to launch a wilderness adventure livestream. The program left a man (dubbed Nature Man) in the woods for three days and let Twitch users control his movements – exactly the type of brand-led livestream that works on that site. Con: The greatest value of Twitch is also its biggest weakness. The channel has a specific demographic. It’s easy to trip on Twitch, where users are suspicious of advertisers and willing to savage those who put promotion before entertainment. Pro: This lesser-known platform has a younger audience and a massive 43% engagement rate. Brands like America’s Got Talent, Snoop Dogg, and Mashable are big users. YouNow is much more influencer-driven than the other livestreaming platforms. Con: Content creators on YouNow have no control over comments, which poses a big risk for brands. Is livestream a component of your content marketing? Share how you’re using it in the comments. Get more insight into creating a better content experience for your audience at the Intelligent Content Conference March 20-22 in Las Vegas. Register today using code BLOG100 to save $100. 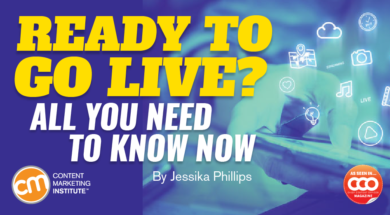 Jessika Phillips is a social media strategist and president of NOW Marketing Group. Follow her on Twitter @NOWMG.